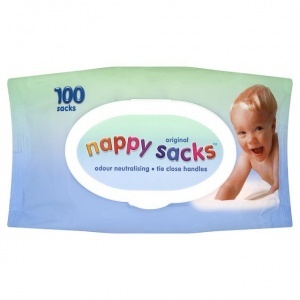 Nappy sacks are essential to ensure the hygienic disposal of nappies after every nappy change. Each sack is the perfect size for a nappy, baby wipes or tissues used during each nappy change. The baby fresh fragrance has been specially designed to not just mask the smell but actually neutralise the odour. Nappy Sacks are the convenient, hygienic and fuss free way to dispose of nappies and trainer pants or even to carry soiled terry nappies or wet clothes when you are out and about. Nappy Sacks are the convenient, hygienic and fuss free way to dispose of nappies and trainer pants or even to carry soiled terry nappies or wet cloths when you are out and about. This product contains a fragrance. If an allergic reaction develops, discontinue use. Not suitable for food use. Do not flush this product down the toilet.